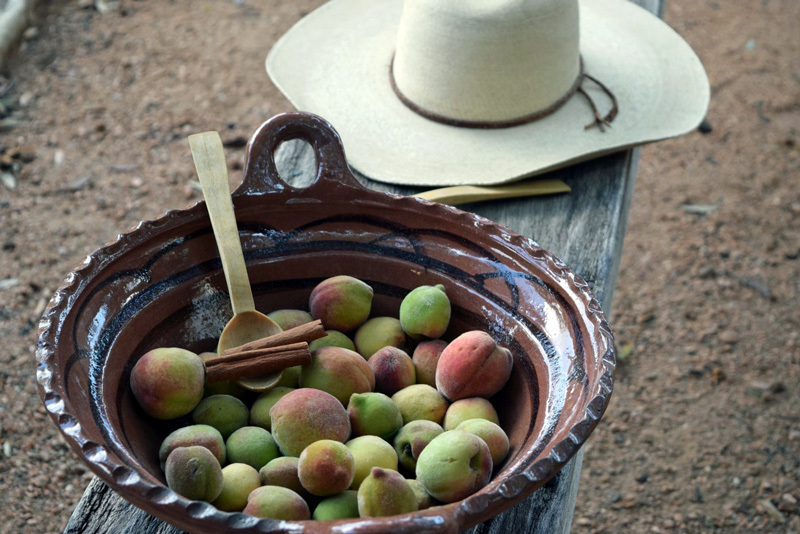 The peach tree at Casa Navarro State Historic Site produced a wonderful and tasty abundance of fruit that was enjoyed by site visitors, neighbors, and wildlife in downtown San Antonio. By the end of June, most of the fruit was gone, but we saved a few dozen peaches to try a recipe from the UTSA Libraries Mexican Cookbook Collection. We found a recipe for Salsa de Ciruelas (plum sauce) in a book titled Recetas Practicas para La Señora de Casa, published in 1890. We adapted the recipe using peaches since they are also a stone fruit, and were more commonly grown in South Texas. 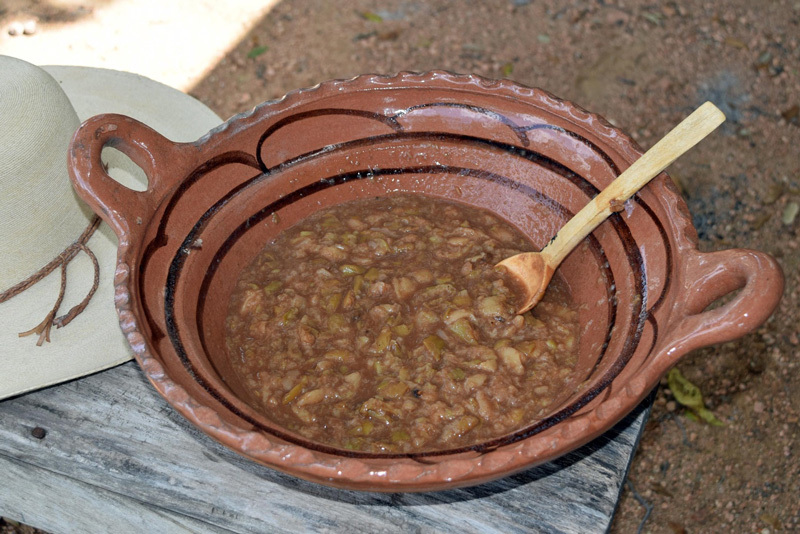 The recipe (below) was vague, but once translated from Spanish to English was simple to make. 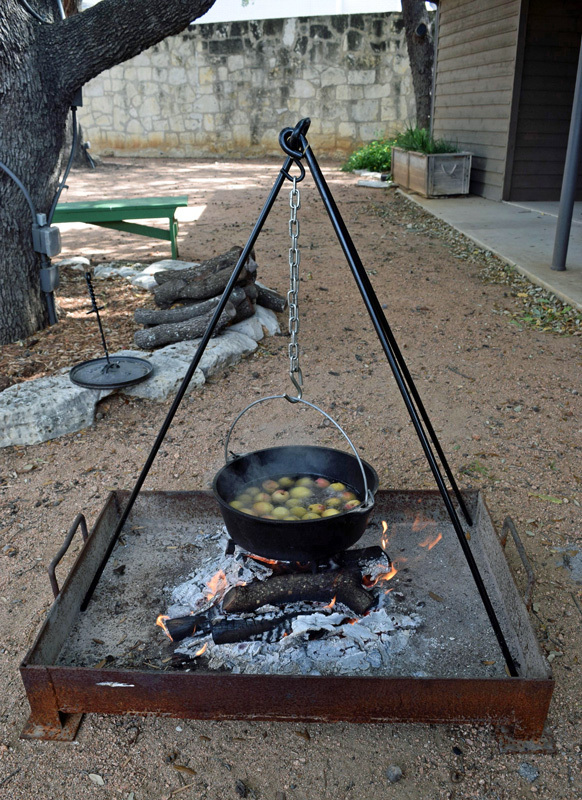 The recipe calls for the fruit to be boiled over a fire with water and a cinnamon stick. Once the fruit is soft enough, it can be pitted and broken up with a spoon. Finally, add sugar and serve. 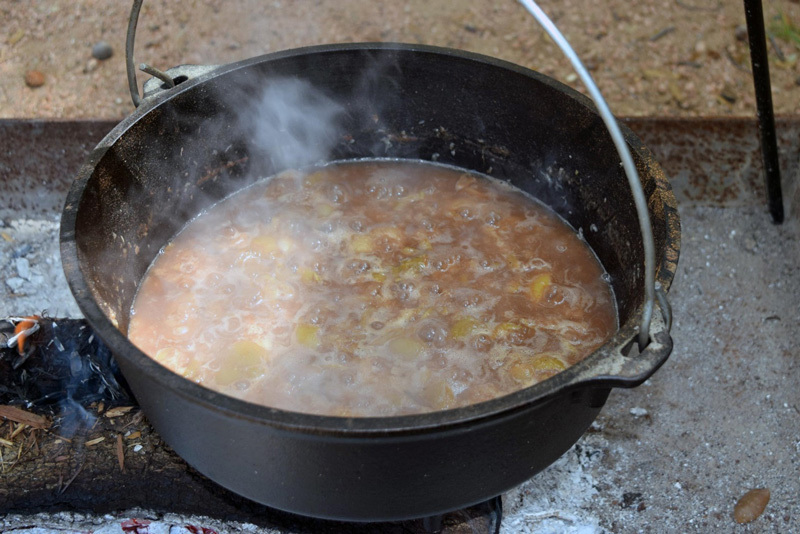 In our experiment, we boiled the peaches, cinnamon, and water in a cast iron pot for approximately 45 minutes over an open fire. 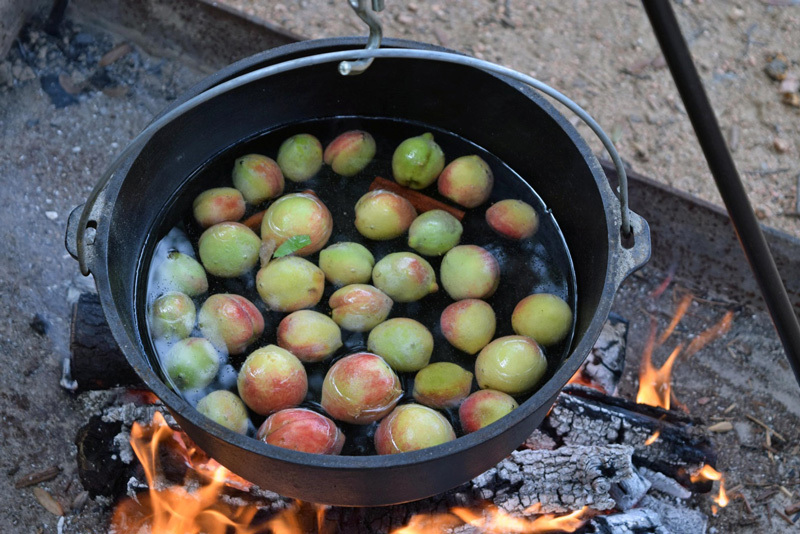 We removed the seeds with a spoon once the fruit became soft enough, and placed the peaches back over the fire to simmer longer, approximately 30 minutes. This made the peaches into a sauce similar to that found in peach cobblers. We then put the peach sauce into a clay pot and added sugar. The sauce had a bittersweet taste due to the combination of the freshly picked peaches and sugar, but tasted great when used as a jam or jelly. If you are interested in reproducing the recipe at home, we recommend waiting until your fruit is very ripe as it will be sweeter when boiled down. Peaches and cinnamon before being boiled in water. Did you remove the peel after a bit, when you removed the seeds? Or does it stay in there? Randy, thanks for the question. We left the skin/peel in the pot when we removed the seeds from the peaches. It is very difficult to remove the peel since the peaches become so hot during the boiling process.